The early-August suicide of a 14-year-old British girl and her father’s anguished Facebook posts about it has prompted the website Ask.fm to beef up its anti-bullying tools and practices. It has also reignited the debate over the extent of online bullying and its impact. Ask.fm is a Latvia-based site that allows users to pose and answer questions from other, sometimes anonymous, users of the site. It has experienced significant growth, especially among teenagers, who can be attracted to the site because it is a place where their parents and other older users do not congregate. After the suicide of Hannah Smith in Lutterworth, England, her father posted about the tormenting she experienced on the site. In response to the outcry, the site announced changes that would allow users to block questioners and to make it easier to report abuse. In America, the site was in the news in recent days because 16-year-old kidnap victim Hannah Anderson used it to describe her ordeal in the Idaho wilderness and the killing of her captor by FBI agents. The Pew Research Center’s Internet Project has looked at the extent of online abuse in America in several ways over the years. 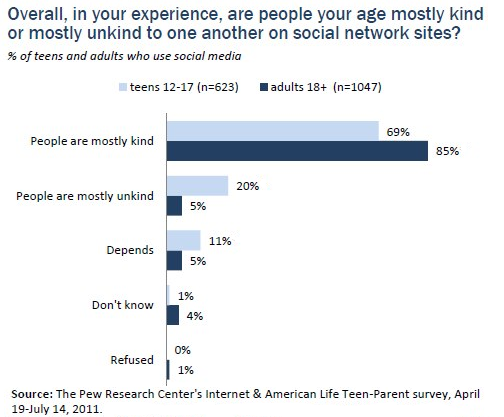 The most recent survey on the subject in mid-2011 found that, overall, most teens say that people are generally kind to one another on social network sites – and that the number of teens having positive experiences in social media outpace the number who have problems. However, 19% of those ages 12-17 say they had experienced bullying either on or offline in the past year, and about 8% say they experienced bullying online. In more general terms, 88% of the teens who use social media said they have seen someone being mean or cruel to another person on a social networking site such as Facebook – and 15% of social-media using teens have experienced harassment themselves. Amanda Lenhart is Director of Teens and Technology Research at the Pew Research Center’s Internet & American Life Project.